Cella di carico a ponte di Wheatstone per pesi da 0 a 20Kg. Le celle di carico sono sensori studiati per misurare forze applicate in un'unica direzione, per cui questo sensore è adatto per la realizzazione di bilance di precisione. A load cell is a force sensing module - a carefully designed metal structure, with small elements called strain gauges mounted in precise locations on the structure. Load cells are designed to measure a specific force, and ignore other forces being applied. 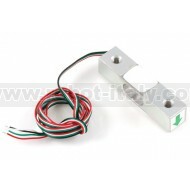 The electrical signal output by the load cell is very small and requires specialized amplification. Fortunately, the 1046 PhidgetBridge will perform all the amplification and measurement of the electrical output. Load cells are designed to measure force in one direction. They will often measure force in other directions, but the sensor sensitivity will be different, since parts of the load cell operating under compression are now in tension, and vice versa. 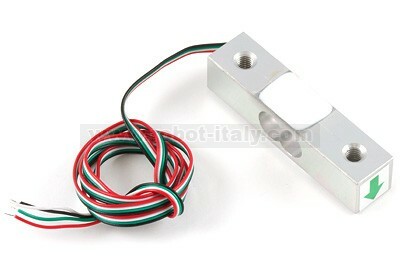 This Single Point Load Cell is used in small jewelry scales and kitchen scales. It’s mounted by bolting down the end of the load cell where the wires are attached, and applying force on the other end in the direction of the arrow. Where the force is applied is not critical, as this load cell measures a shearing effect on the beam, not the bending of the beam. If you mount a small platform on the load cell, as would be done in a small scale, this load cell provides accurate readings regardless of the position of the load on the platform. The Data Sheet below has a comprehensive glossary that describes in practical terms the meaning and usefulness of the specifications. Make sure to calibrate your load cell before using it. You can find information on how to calibrate the cell in the 3134 Datasheet. You should also look at the 1046 – PhidgetBridge Product Manual. The following table shows how to connect the Load Cell Wires to the bridge connectors.